I finished wrapping up all the little bits and pieces of "I Dissent" last month. Now I must wait wait wait to share my hard work with you. But first, a cover reveal! This was originally shared on Debbie Levy's (the author of this amazing story) web site. You should probably check it out because she is going to being all sorts of useful RBG stories and tid bits until our much anticipated publish date in September. Ok, maybe more like Pink and Green Package day...but exciting nonetheless. 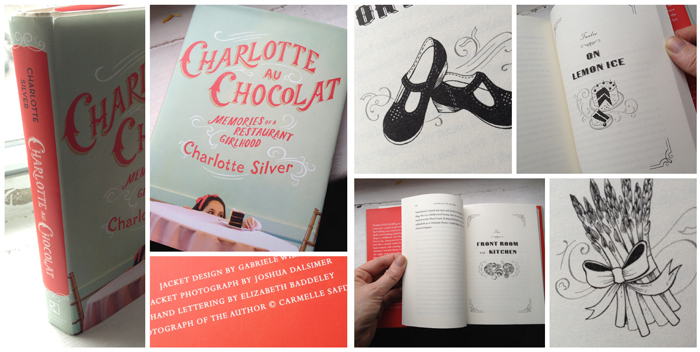 I recieved me copy of "Charlotte Au Chocolat" in the mail today! I'm so excited. This is my first hand-lettered book cover AND I got to do the interior spots. Getting this job was a classic example of being in the right place at the right time (that is being an intern at Penguin who can put together four hand lettered sketches in one afternoon). I think I will reread this adorable memoir to celebrate.